Native American Symbols, like the Morning Star symbol, can vary in meaning from one tribe to another and across the culture groups of North America. Discover facts and information about the meanings of secret and mysterious symbols used by Native American Indians in our List of Symbols including the Morning Star symbol. 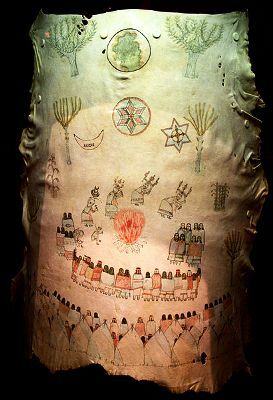 Native American Indians were a deeply spiritual people and they communicated their history, thoughts, ideas and dreams from generation to generation through Symbols and Signs such as the Morning Star symbol. Native American symbols are geometric portrayals of celestial bodies, natural phenomena and animal designs. The Morning Star symbolizes hope and guidance. The morning star is the brightest star in the sky at dawn. The morning star is actually the planet Venus as seen in the eastern sky around dawn. It is used by many Native American Indian tribes and usually has meanings related to past spirits and ancestors. In many of the Native American cultures the ancestors were represented as stars. For additional information on this subject refer to Star Chart & Astrology. The Great Plains Indians honor the morning star as a sign of courage and purity of spirit. 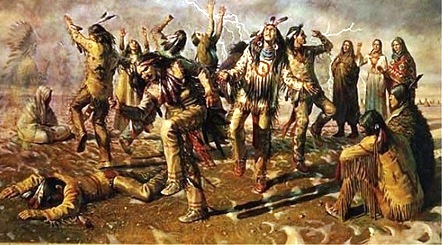 The Ghost Dance Religion used it as a symbol of the coming renewal of tradition and resurrection of the heroes of the past. The Religion, Ceremonies and Beliefs of the American Native Indians were dominated by Shamanism in which a religious leader, called a Shaman, acted as a medium between the visible and spirit worlds. Two Paiute prophets, or shamans, named Wodziwob and Wovoka, introduced the Ghost Dance in a mystical ceremony designed to re-establish the native culture and restore the environment to pre-European levels. 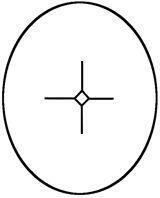 The Morning Star symbol is closely associated with Sitting Bull, another famous shaman. 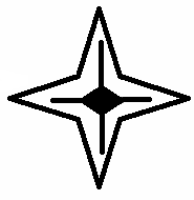 The symbol of a Shaman is often associated with the following shaman sun symbol and the similarities between the symbol and Morning star symbol are evident. There were so many tribes of Native American Indians it is only possible to generalise the most common meaning of the Morning Star symbol. The Pawnee tribe practised the ritual killing of a young girl in their Morning Star ceremony. Native Indian symbols are still used as Tattoos and were used for a variety of reasons and depicted on numerous objects such as tepees, totem poles, musical instruments and clothes. Indian Tribes also used their own Colors for Symbols and designs depending on the natural resources available to make Native American Paint. Use symbols as ideas and designs for American Indian Tattoos. 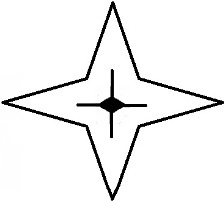 Their religion was dominated by rituals and belief in a spiritual connection with nature and these beliefs were reflected in the various symbols they used such as the Morning Star symbol. Morning Star. Discover the vast selection of pictures which relate to the History of Native Americans and illustrate many symbols used by American Indians. The pictures show the clothing, war paint, weapons and decorations of various Native Indian tribes that can be used as a really useful educational history resource for kids and children of all ages. We have included pictures and videos to accompany the main topic of this section - Morning Star. The videos enable fast access to the images, paintings and pictures together with information and many historical facts. All of the articles and pages can be accessed via the Native Indian Tribes Index - a great educational resource for kids.